The silver half dime was the first coin issued under authority of the United States Mint. Scholars still debate whether the one-year-only type of 1792 was a pattern or a regular issue, but the fact remains that most surviving pieces are well worn. 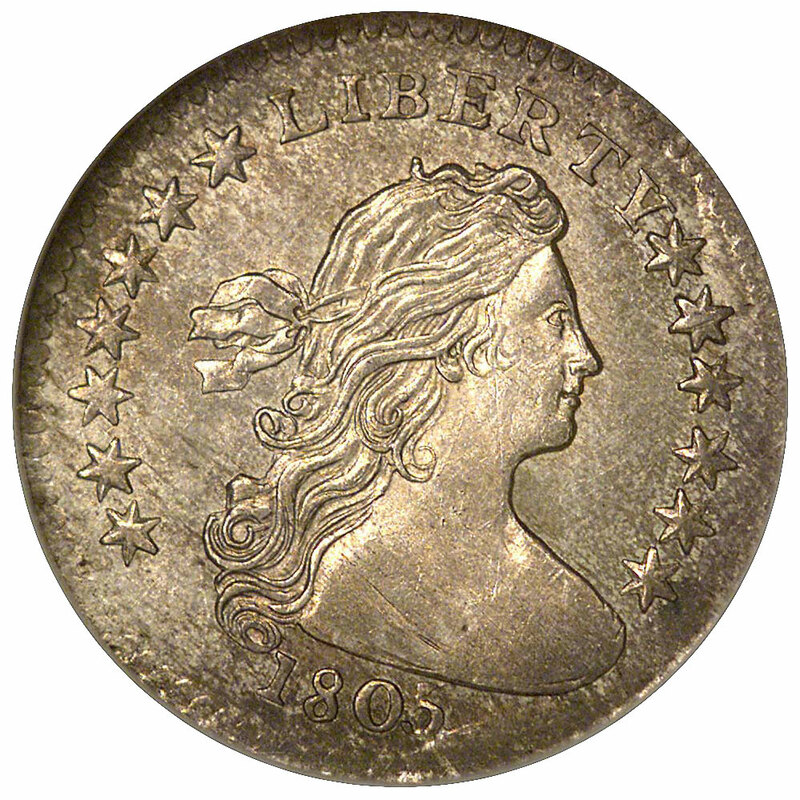 The Flowing Hair Liberty type of 1794-95 was also short-lived, giving way to the more attractive Draped Bust design in 1796. An old story has it that this bust of Liberty was modeled after Philadelphia society figure Ann Willing Bingham, but there is no contemporary account to corroborate this tale. Half dimes dated 1796 and 1797 have this portrait paired with the Small Eagle reverse, while the Heraldic Eagle design was introduced with the coinage of 1800 (no half dimes were dated 1798-99). In this form the coinage of half dimes continued through 1805, though none were produced bearing the date 1804. 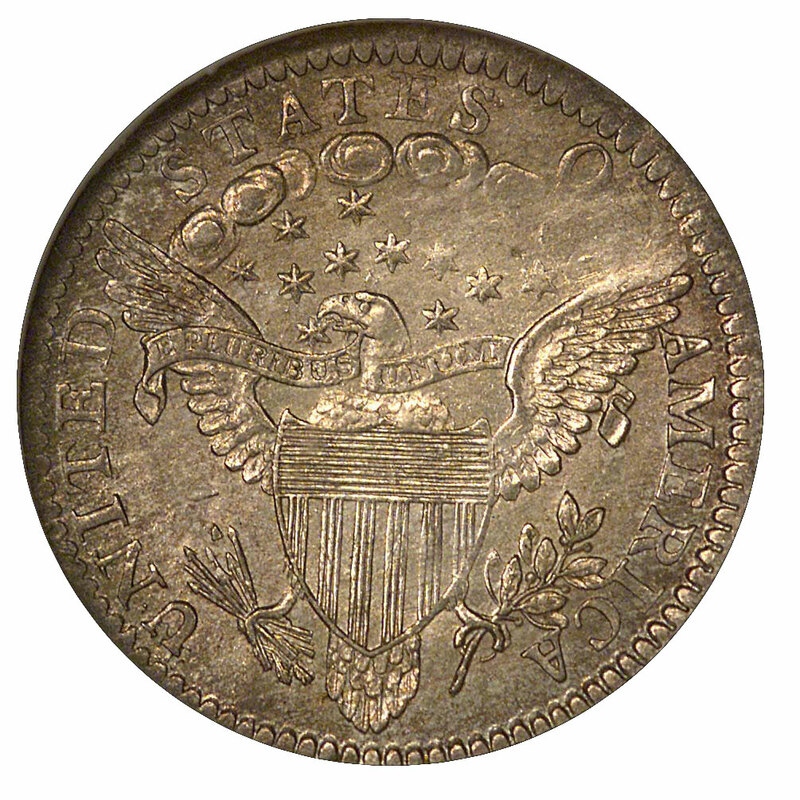 The coining of half dimes was suspended after 1805, with no more appearing until 1829. This denomination was rarely ordered by those depositing silver with the U. S. Mint, and there were also plenty of Spanish half-real pieces, or medios, to take their place in circulation. The only rare date within the Draped Bust series of 1796-1805 is the 1802, of which about 35 examples are known in all. One overdate is known, 1796/5, indicating that coinage of this type was anticipated for 1795 but never effected. Draped Bust half dimes are very difficult to grade, because they seldom struck up fully. The typical example is incomplete at its centers, and even mint state pieces are often missing the finer details. Complicating matters further is the frequent presence of planchet adjustment lines. These are file marks made on the planchet prior to striking for the purpose of reducing its weight to the legal specification. Inexperienced persons may mistake these for simple scratches, though professional graders recognize them as a mint-made phenomenon. A few, shallow adjustment lines have little or no effect on a coin's grade, but numerous and heavy file marks will certainly impair a coin's appearance and reduce its grade. Mint state half dimes of the Draped Bust type are very rare. Because of their small size and weight, Draped Bust half dimes are not subject to heavy nicks and abrasions, but other factors come into play. Most pieces either have irregular, blotchy toning or have been dipped (in a mild acid solution) to fully white. How much their luster has been impaired by dipping is often the determining factor in assigning a grade. Given the rarity of uncirculated Draped Bust half dimes, most collectors will have to satisfy themselves with a worn specimen. 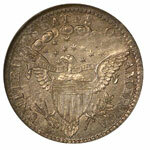 Even in the higher circulated grades, these half dimes are very scarce. Aside from 1797 and 1800, all dates are seldom seen except in heavily worn condition. Again due to their uneven striking quality, these coins wear in an irregular pattern. This may result in a specimen having bold central devices but flattened lettering. The opposite may also occur, with the coin displaying full legends while the bust of Liberty and the eagle are nearly worn slick. Most Draped Bust half dimes do not exactly fit the written grade definitions. A coin may be Fine on its reverse and only Good on its obverse. 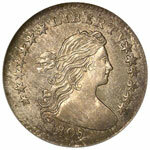 As in selecting any coin for one's collection, the most important component is eye appeal. Whatever a coin's grade the features to look for include fullness of strike, quality of surfaces and naturalness of color. With Draped Bust half dimes, however, some compromise of these standards will always be necessary.